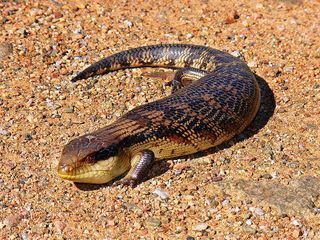 Blue tongue skinks are grey or pale brown in colour, with dark irregular bands across the back and tail. Like other species of skink, the scales are small and very shiny and the legs are comparatively small. They grow up to 45 cm and is one of the largest species of blue-tongued skink. As the name implies, the skink has a pale blue tongue, contrasting with the red lining of the mouth. When threatened, the skink gapes its mouth and hisses in defence, swelling its body to look more impressive. Hatchlings can be kept in 10 gal. Adults require at minimum 40-55 gal tanks; these lizards are wide-ranging inthe wild and so do better in much larger enclosures. Substrate can be clean dust-free pine (not cedar) shavings, aspen shavings or cypress mulch. Most prefer snug hides, so hide boxes, rock caves or half logs will be needed. While these are ground dwelling lizards, they do have to clamber over things to get their relatively large bodies over things with their outlandishly tiny legs and feet. Many seem to enjoy the exploration and exercise climbing over and through things gives them, so providing different levels of branches and logs for them to climb on will make for better adjusted lizards. This also means that top-opening tanks need to be securely fastened, and open-top tanks need to be deep enough to prevent the skink from climbing out. One area of slightly damp substrate should be kept, or a humidity retreat box (into which they can freely climb in and out, filled with damp sphagnum moss or a loosely piled damp towel, for use during shed periods). They should have a bowl of water available at all times. They may defecate in it so it should be checked regularly. Bowl should be big enough for them to climb easily in and out of if it is to be used for bathing. Regular exposure to UVB wavelengths are strongly recommended. This can be furnished by close proximity to a Vita-Lite or Zoo Med Iguana or Reptisun fluorescent lights (5.0+) or direct sunlight. If using the latter, be sure that there is a cooler retreat for the skink to go to. They do not tolerate very high temperatures and can easily become prostrate by the buildup of heat in their enclosure. The overall gradient should range from the mid 70s on the cool side to the mid on the warm side. A warmer basking area, with temps well into the 90s, must also be provided during the day. Depending on the type of skink and its place of origin, some will do better with basking areas into the low 100s, while others need basking temps in the low to mid 90s. Observe your lizard for signs of temperature related stress, and adjust accordingly. A people heating pad under the tank at one end, and a radiant heat source overhead at the same end, will generally be all that is required to establish the necessary gradient. Cold winter weather outside will require additional heating or a stronger bulb in the enclosure. Temps should not be allowed to fall below 70 F at night on the cool side. Blue-tongues are omnivores, consuming both plant and animal matter. Their diet should be about 60% plant and 40% animal. A basic mixed vegetable salad can be prepared similar to that fed to green iguanas. Along with the salad, thinly sliced greens (collards, dandelion, escarole) can be mixed into the mixed vegetables. Frozen vegetable mixes are either mostly corn and carrots, or mostly cauliflower and broccoli. Neither are particularly good for skinks and other animals. Corn and carrots convert quickly to sugars, and carrots have oxalates, which bind calcium, preventing its uptake. Cauliflower and broccoli contain goitrogens which bind iodine, leading to impaired thyroid function. In additional, the thiaminase in frozen green vegetables and greens destroys the thiamin (B1) in the plant; when fed regularly, this leads to a thiamin deficiency. If you use frozen vegetables or freeze your own fresh salad. Many skinks seem to relish berries and juicy fruits, so think about keeping a supply of frozen blueberries and cherries around, as well as fresh berries, peaches, nectarines, and pears during the season. A bite or two of banana is generally not refused, either. Hatchling skinks can be started on mealworms, redworms, small crickets, and pinkie mice. As they grow, increase the size of the prey (small earthworms, Zoophoba larvae and pupae, fuzzies and crews). Feed the skinks ad lib, that is, however much they want to eat, when they want to eat. Feeding frequency will taper off as they grow, so you may find that you are offering food 2-4 times a week. Blue-tongues are pretty eloquent when they are hungry (they clearly fixate on your hands and any other perceived movement, often with their mouth open and body ready to charge or pounce), so they are unlikely to go hungry for long so long as you keep an eye on them. Fresh drinking water should always be available for them. Blue-tongue skinks are very docile, curious lizards. They tame easily and are handleable by careful small children. They do develop claws, and while they don't particularly scratch, it can be startling and scary to someone who is nervous holding them, so always supervise people closely when first handing the lizard to them. Like many omnivorous and carnivorous lizards, blue-tongues find that wriggling human fingers look an awful lot like small wriggling mice...and may try to eat one if they are hungry. As with all such reptiles, it is best to wash your hands before handling them if you have been handling anything they normally eat. All livestock will be on customer collection only basis as we will not send animals by mail.